So, we’ve been telling you all about the upcoming release of the new Pidoco. Now it’s only a few weeks before it will be arriving. To allow you to familiarize yourself with the new Pidoco version, we have put together a little guide showing you what’s new. Enjoy! Quick Actions: Instead of the old tabs, we have turned some of the most important options, such as editing, sharing or exporting into quick links that allow you to more easily access them. Toolbar: We have added a toolbar to the Home view to make work even faster for you. Search: Now you will be able to search for projects, which is especially useful if you have many. Filtering and sorting functions are now available to manage your projects more efficiently. The new project view greets Pidoco users with a map of the entire project, offering easier orientation and a better overview. Perhaps the biggest change in the Project view is the new Map feature. The Map will give you a visual overview of your entire project, allowing you to quickly find and access the right pages or simply get a better grasp on the project. Zoom in to see more details or zoom out to get a bird’s eye perspective. Of course, you can always switch to the list view to search for pages or sort them into folders. Note: For existing projects, you will still see the page list first. Upon switching to Map view, you will find your pages and can arrange them as you see fit. 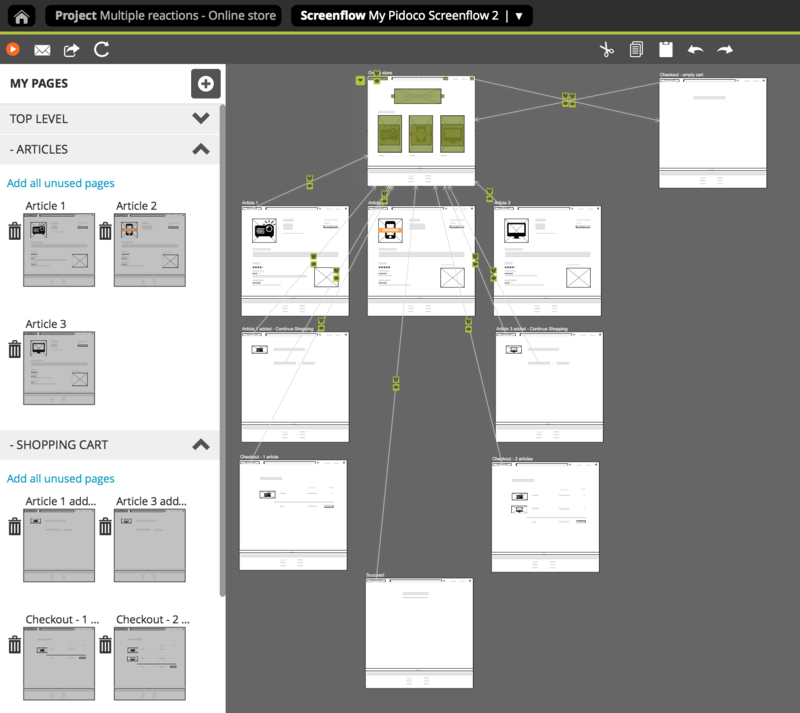 The new Project view also comes along with several tabs that neatly contain the available functions. 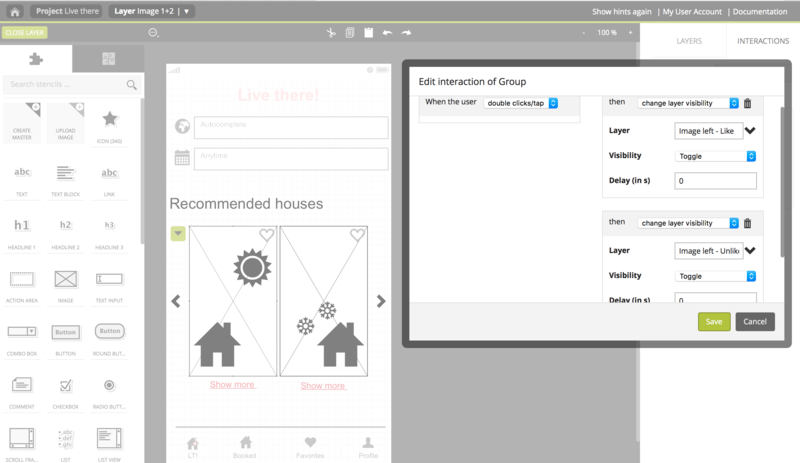 They will be replacing the tabs of the current Home view. Assets: This is where you can now manage all your assets. 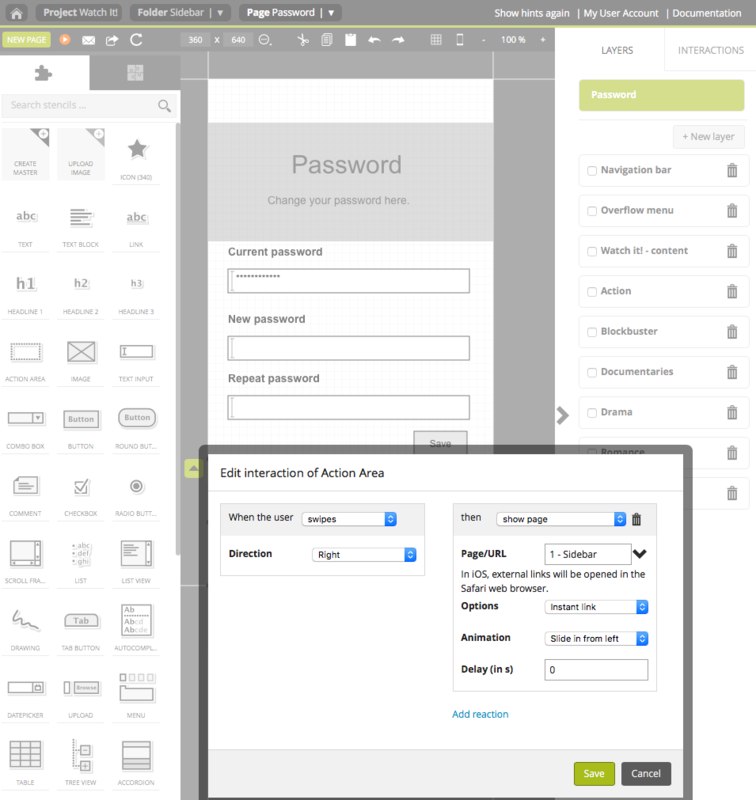 Upload screens, graphics or icons, create screenflows or manage your masters and layers. Comments: This is the central place for reading and replying to feedback you receive through the commenting feature. Collaboration: Managing invitations and access rights happens in this tab. Versions: This is where you can now find all versions of a project – manually generated milestones as well as auto-saved backups. The editor view now offers easy access to all comments without interrupting the workflow. 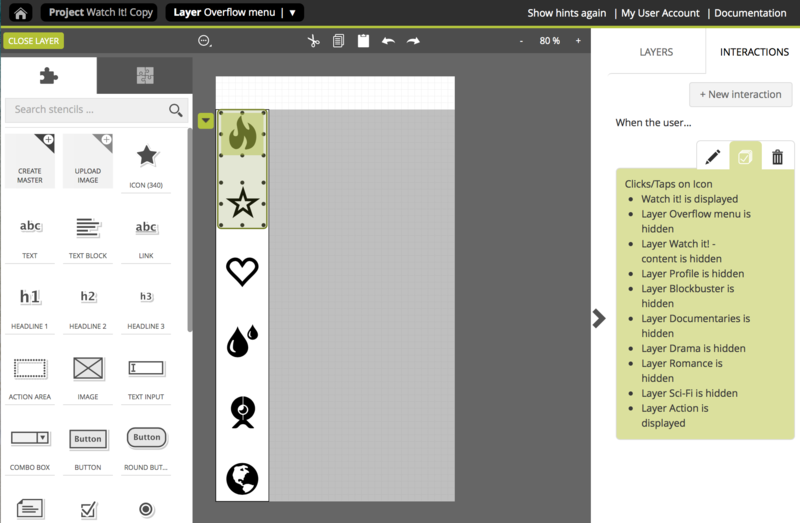 The layer panel also has received a new design. Comments panel: You can now read and reply to feedback directly as you are editing your project. Layers panel: The layers panel has received a redesign to make it easier to distinguish the page from the layers and to allow you to focus better on the stage. 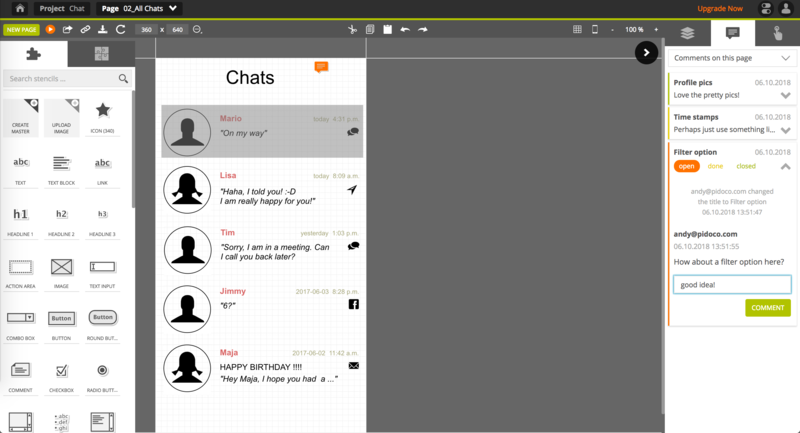 With its new design, the preview shows the prototype in action and will be equipped with a new full-screen mode. 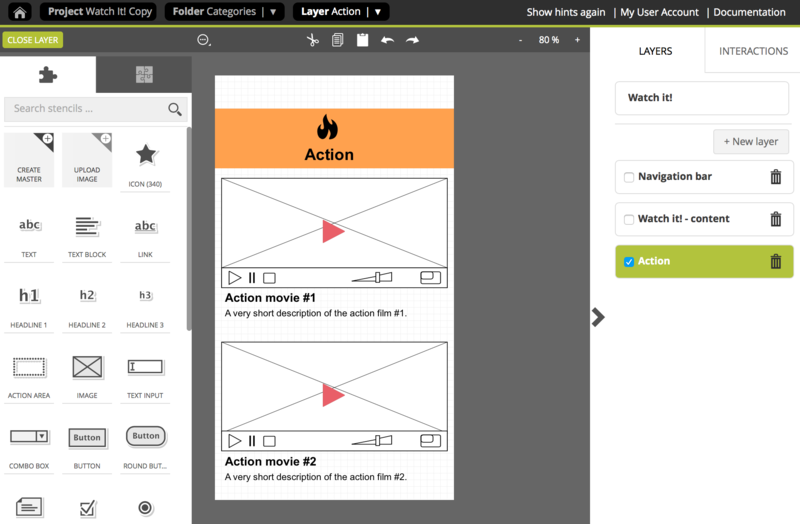 The preview will have not only a new design, but also offer a new full-screen mode for viewing projects without any distraction. The comment markers now come in different colors, signalling their respective status for an easy overview. 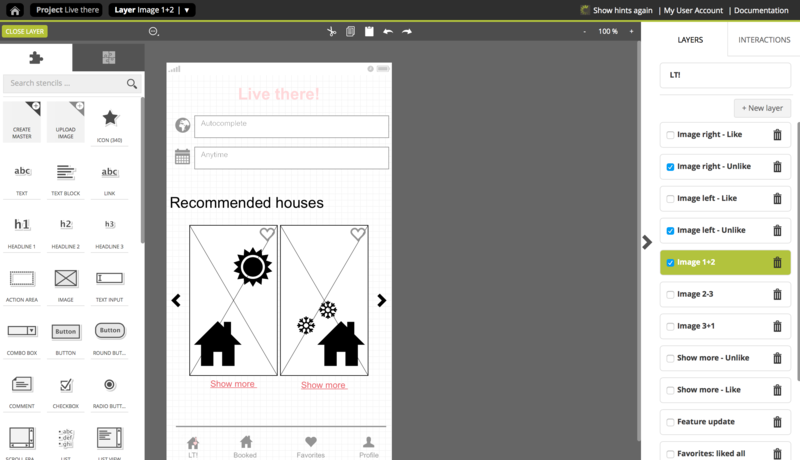 Of course, we are keeping the different hand-drawn and wireframe modes, so you can choose how to present your project best. 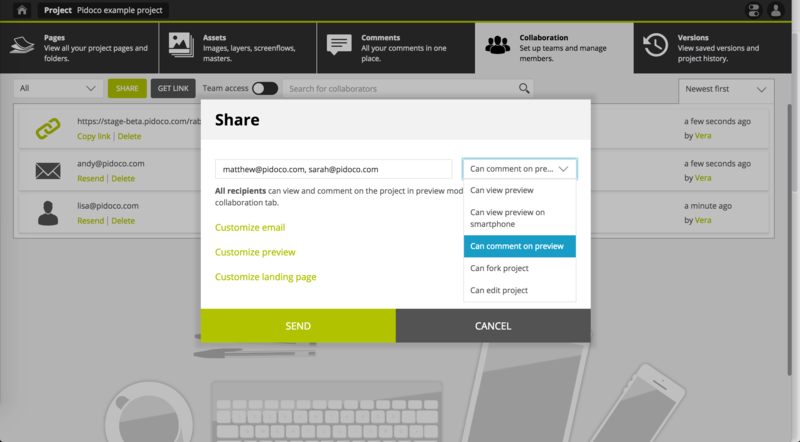 New convenience functions and an improved sharing feature make working with Pidoco even more productive. New design: The pretty “flat” design looks a lot cleaner and will show your projects in the best possible light to give them full focus. New dialogs: All dialogs have been revised to make them easier to use. 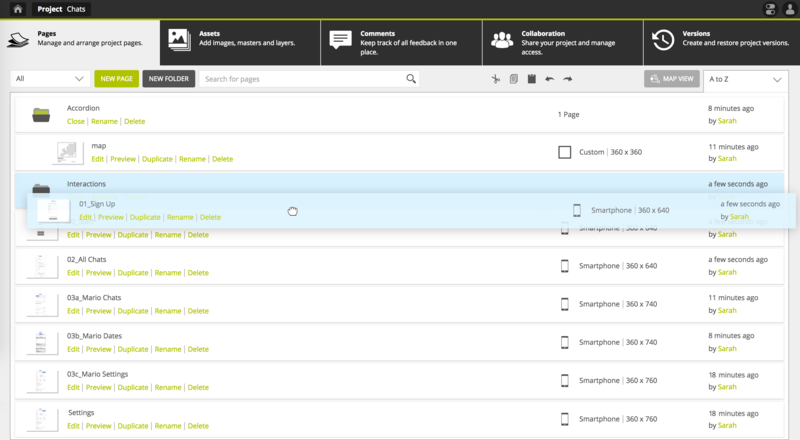 Drag & drop lists: The project, page and asset lists now allow you to sort items using drag and drop. Filtering and sorting: Filtering and sorting functions will be available in all list views to help you manage pages, assets and more. Quick Search: The dynamic search function will be available in almost every view. Sharing: You will be able to retrieve the sharing links without having to send an email. 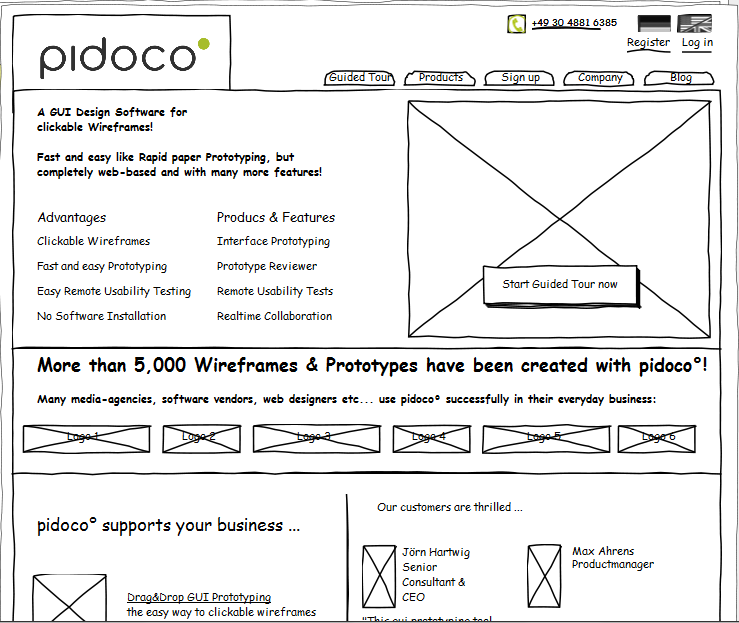 We are very excited to share the new Pidoco with you in just a little while and hope you’ll like it. So, watch out for the release date! Your goal is to offer the best experience possible to your users. You don’t want them to go the extra tap mile to navigate between pages, to delete an item from a list, to add a song to a playlist, to archive a message or to unsubscribe from a newsletter. Actions like these are all so-called contextual actions and always relate to touch gestures. Contextual actions are a good way to provide quick access to quite common actions in a mobile application and at the same time are a brilliant way to reduce the number of taps the user needs to complete the task. 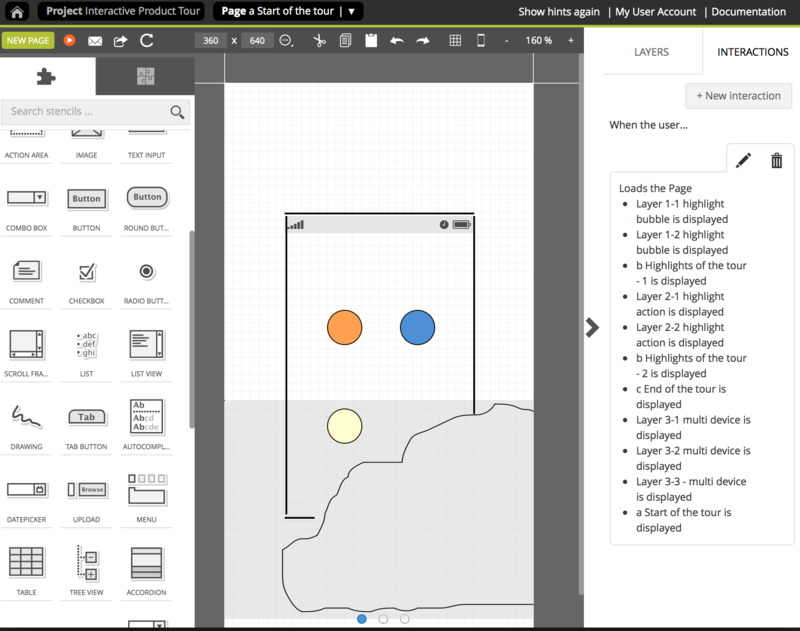 What to consider when including contextual actions in a mobile application? When executing a contextual swipe action, most of the people expect a destructive result, such as deleting. That’s mainly because of the original use of the swipe gesture towards the left in order to delete an item. This well-known gesture also relates to the physical act of crossing something out on a list. 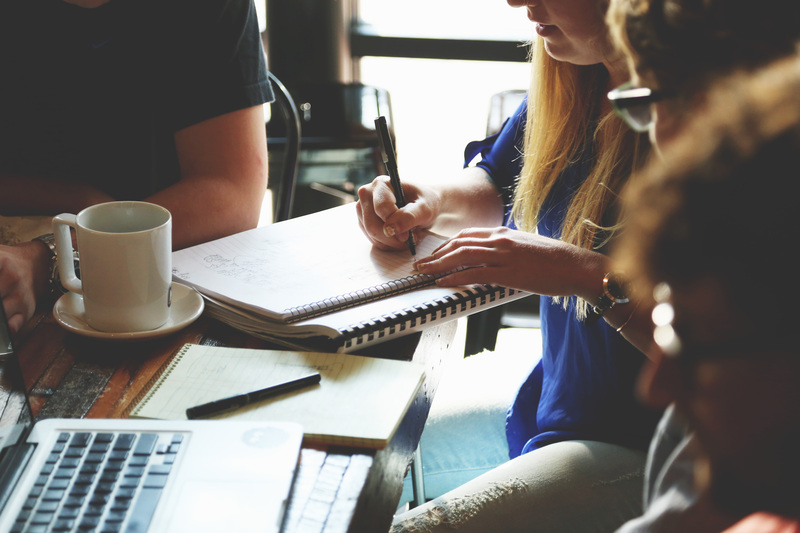 To create effectively working contextual actions consider some more points. 2. Consistency: Keep the meaning of the contextual swipe action consistent throughout the app. When multiple actions are associated to the same touch gesture you confuse users. 3. Confirmation: To avoid frustration and error, ask for a confirmation before completing an action. 4. Conflicts: Don’t use too many swipe gestures and make sure they don’t interfere with other swipe actions (e.g. to navigate between pages). 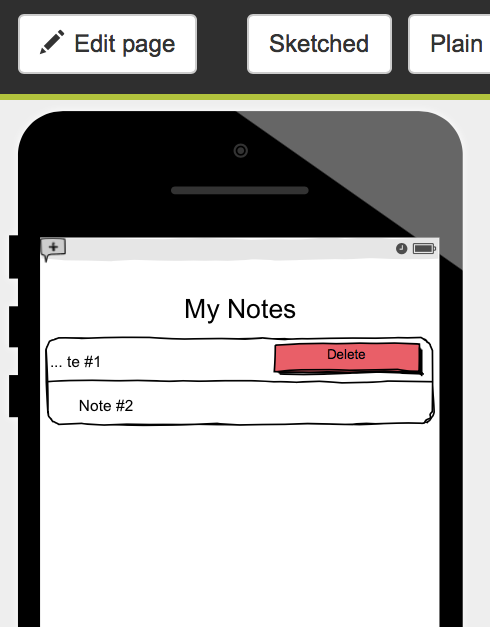 I created a mobile project called “My Notes”, which is a prototype of an app in which you write down your thoughts or create to-do lists or sketches etc. My app includes a list with two notes. When swiping to the left of one entry, a “Delete” button shows up and after tapping on it, the note is deleted. First I created the pages for my list – one for each state: full and empty list and add a page for the two notes that should be displayed in the app. The pages all serve as frames only as the content will come from the layers I added. That’s why in my prototype all the 4 pages nearly look the same. Here: I added a status bar to the top and a headline. The footer differs only a little. The pages that list the notes have an extra text stencil at the bottom to display the total amount and the empty list contains a little icon at the bottom right to create a new note. Additionally, I used 7 layers, whereas each represents the different stages of the deleting process: full list, item #1 deleted, item #2 deleted as well as the 4 layers that display the respective buttons. 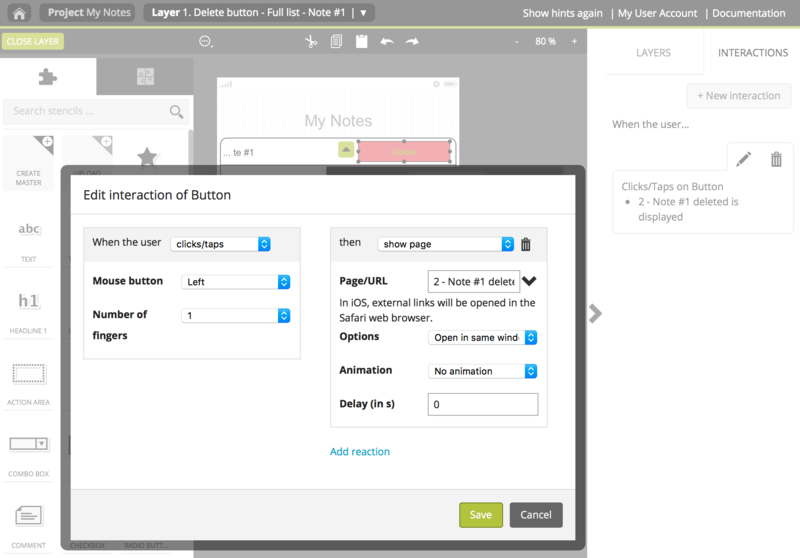 Here: I created 4 layers in total, one for each required button in the full list and two after the deletion process. 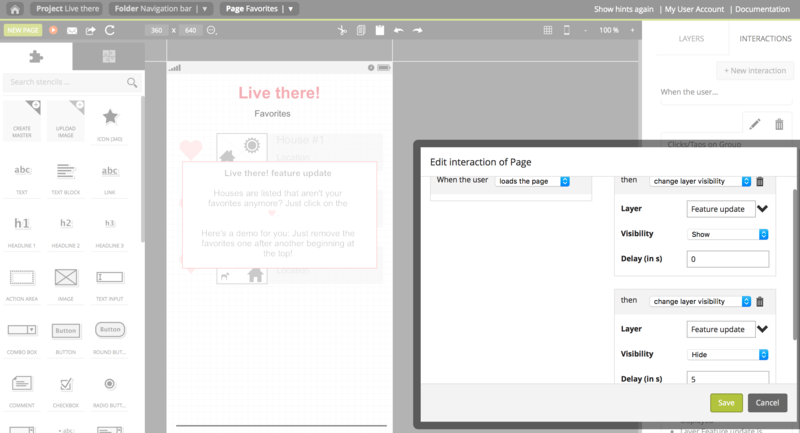 I recommend to create the pages and layers first. You can add the content later, but it helps you to quickly build and link your content. Now let’s continue the work at the contextual action to delete a note with a quick swipe to the left. To do so we proceed step by step. We start on the first page (Here: “1 – Start: Entire list”) and activate the first layer that contains the complete list (Here: 1. Full list) consisting of one list with 2 notes and 2 lines of text. For that I added a list stencil and placed some text in the lines. Let’s delete the entry #1 first. For that we add the following interaction pairing to the action area: When the user swipes to the left, then change layer visibility and select the layer that contains the respective delete button. (Here: “1. Delete button – Full list – Note #1”). Now, we open the layer with the first “Delete” button. (Here: 1. Delete button – Full list – Note #1) Then we add a button to the first entry, change the color (via the context menu) and add it to the right of the list. To visualize the swipe action even more, we can adjust the text by moving it a little to the left and reducing the length. Step 3: Tap on “Delete” to confirm your destructive action. We know it’s necessary to tap on the “Delete” button to confirm the destructive action. That’s why we link the button to to the prompting page that shows the second list entry only. Here: After deleting the first list entry, the interaction pairing is: When the user clicks/taps, then show page “2 – Note #1 deleted”. Step 4: The entry is deleted. Now only one entry is left on the list (Here: item #2). We can also delete this entry. To do so we add another contextual action by repeating the previous steps. As the list will be empty in the end, we only link “Delete” button to a blank page (Here: “3 – Result: Empty list”). To delete the second list entry, repeat these steps and only change the layers and page accordingly. Voilà! To test your contextual actions take your mobile device, open the Pidoco app (available via Google Play or the App Store) and start the simulation of your project by selecting it from the project list. That’s it! 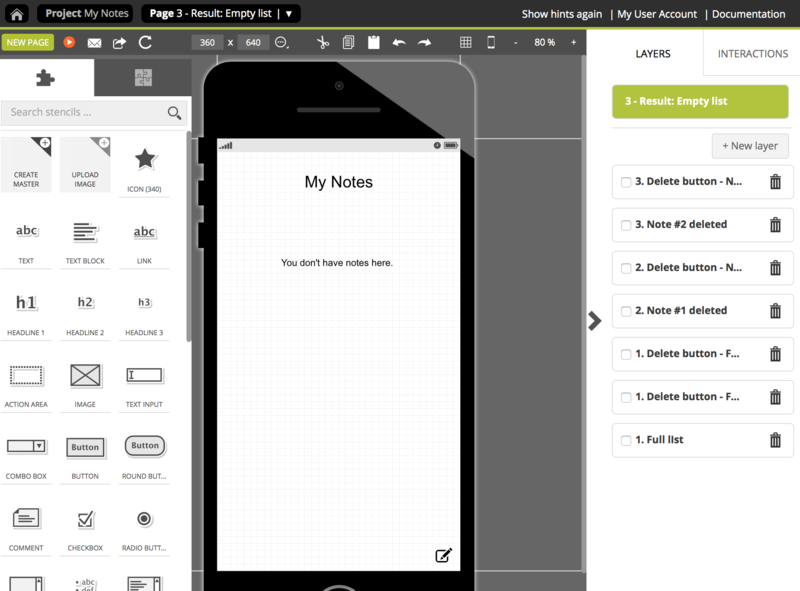 You just finished your your project including contextual swipe actions. Have you ever managed to reach the bottom of your social media feed? Probably not! Because it applies the concept of infinite scrolling. That’s definitely a trending and dynamic way to replace the pagination links and to display the vast amount of data on both mobile devices and websites. How does it work? This one-pager makes clicking to see new or more content redundant. Because the main functionality of an infinite page is that the user scrolls the content and every time the end of the screen apparently has been reached, new content is continually and automatically loaded . The only thing that should be kept in mind, because it might limit the use, infinite scrolling considerably triggers the user’s attention and although it’s kind of optimistically tempting and challenging to never be able to reach the end of the page, it can also be very exhausting and frustrating. 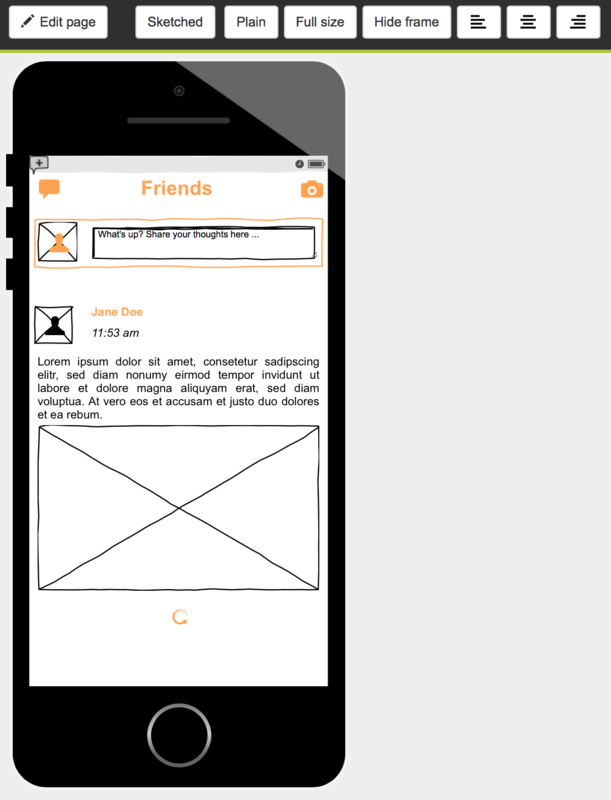 To visualize the infinite scroll page, I created a mobile project called “Friends”. That’s the prototype of an app where you and your friends can update each other on the latest things such a news, thoughts or images etc. These updates are shown on the screen of the mobile device and if you scroll the page more news by your friends are displayed. As one-pager, my prototype of course consists of 1 page only and additionally has some layers. And here’s a little confession: Although we’re about to create an infinite scroll page, and usually you won’t be able to reach the bottom of the page, our project will have an end. 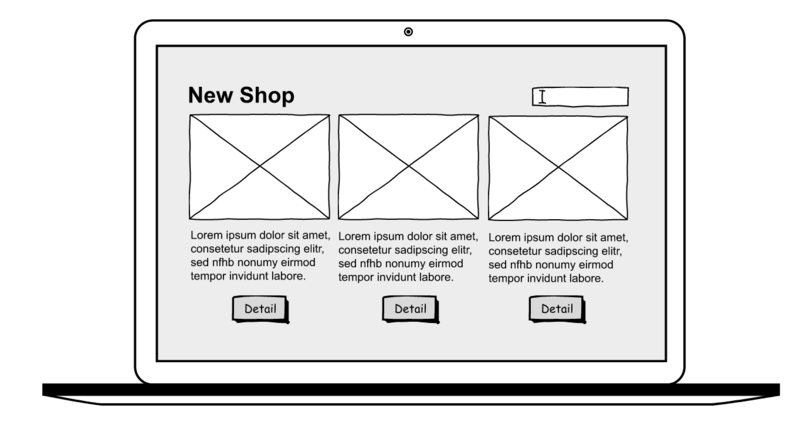 But as a prototype, it of course will help to demonstrate the behavior of the infinite scroll page. That’s why my infinite scroll page can be scrolled three times and then the end will be reached. So a total of 7 layers is needed, whereas there’s 1 layer for each scrollable content to be displayed (here: 4 layers). Additionally, a loading symbol should appear for a short time when new content is loading while scrolling down the page. That’s why 1 layer for each loading screen (here: 3 layers) is needed, too. Based on the default height of 640px, we increase the page size using the toolbar at the top of the canvas by a little more than 3 times and set the height to 2100px and also added some elements like a status bar and icons. Now that we have built the basic structure of our project, we continue creating the content of the infinite scroll page. 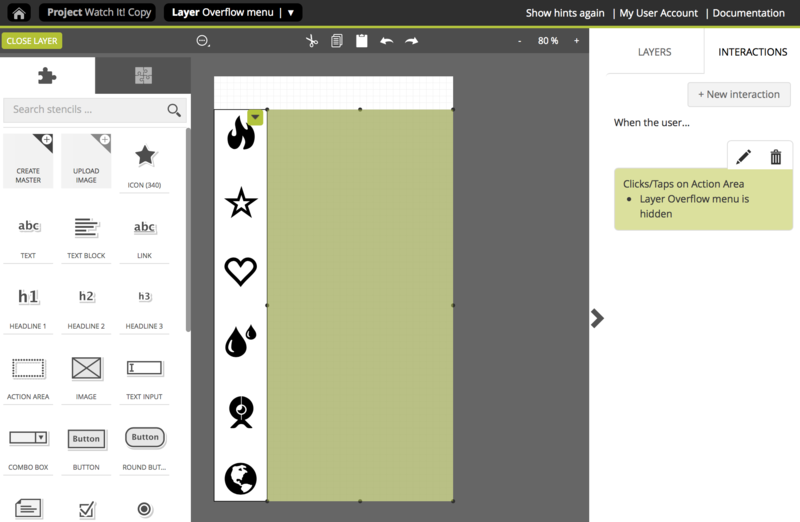 That’s why we create the first layer by clicking on “+New layer” in the layers panel and add some placeholders such as an icon, image stencil and some text. For a realistic scrolling experience, the first screen ends with the default page height. Hence, the content won’t exceed the height of 640px. Repeat that step for the other layers that are continually loaded. The content of the next layer then starts where the content of the previous layer has ended and so on and so forth. Let’s go on and add the loading page icon. To do so, we add a new layer again and add a loading icon. Just use the quick search bar at the top of the stencil palette by entering “load” and drag the icon to that position where the layer that contains all the news ends. Repeat that for the other loading icons. We continue with the interactions. When about to reach the end of the screen, more content should be loaded. That’s why we make use of action areas on each content layer. 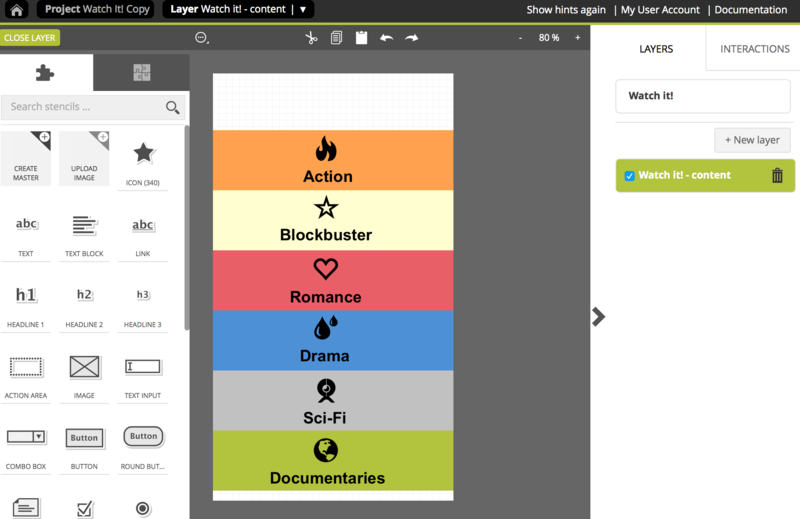 The first action area starts at the half of the content layer. 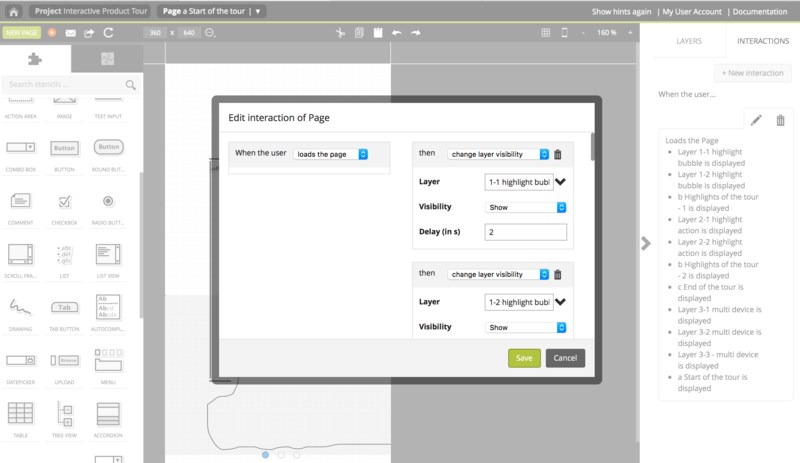 Since first a loading symbol should be displayed and then the new content should appear when the user scrolls the page, we add the following interaction pairing in the interaction dialog: When the user hovers, then change layer visibility. (Note: We use an hover action here, because while scrolling the screen we inevitably hover with our mouse over the entire screen!) Now we select the layer that contains the first loading icon (Here: Load 2) and set the visibility to “show”, the next reaction makes it invisible again by selecting change layer visibility and setting the visibility to “hide” and adding a delay of 1 second. 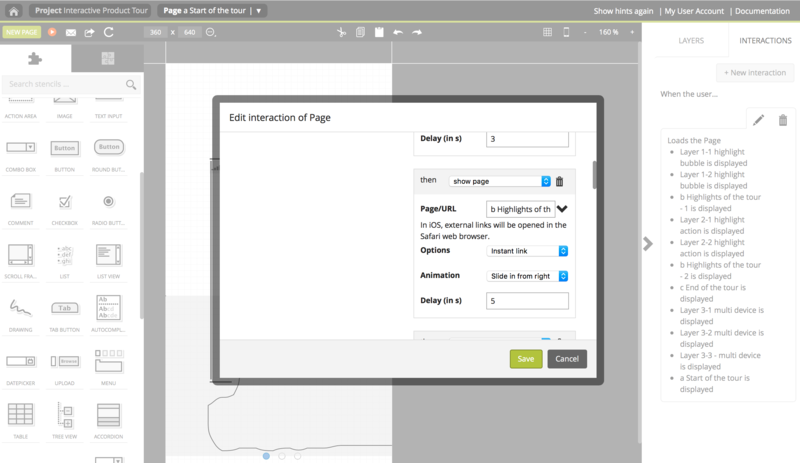 The final reaction to be added is change layer visibility, choosing the layer with the content to be displayed next (Here: Content 2), setting the visibility to “show” and using the delay of 1 second. Repeat that for all the other layers. 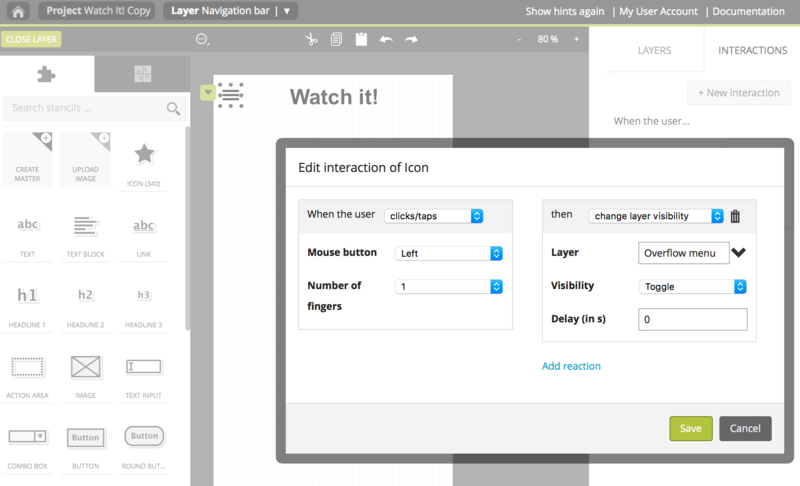 Hint: Don’t forget to deactivate the layers again that we only activated to align our action area. 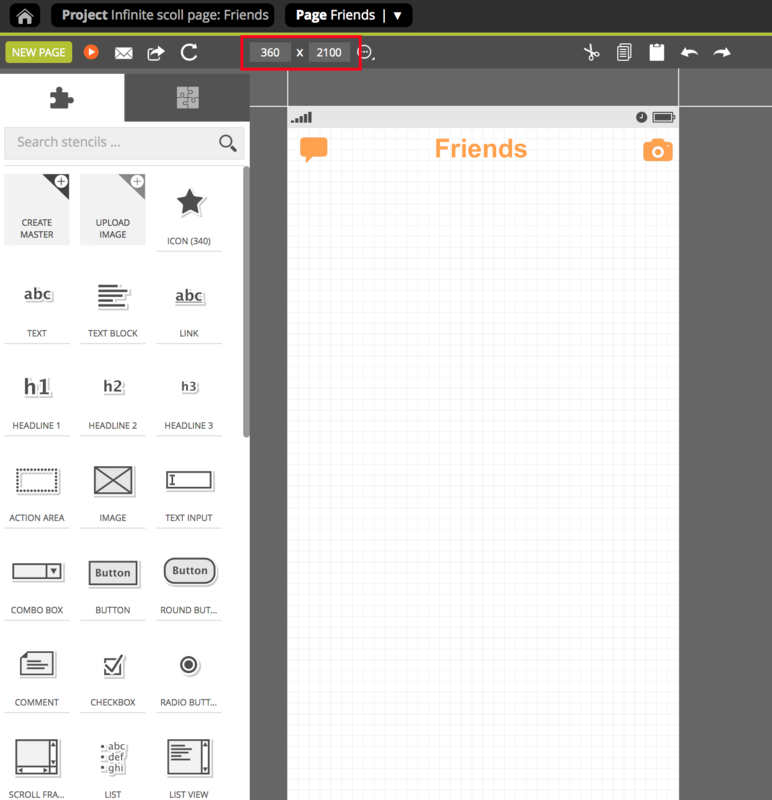 To start the app only the layer needs to be displayed that contains the first content. Having reached the end of the news feed, there should be an option to automatically jump back to the start to avoid annoying scrolling back to the top. Therefore we add an arrow as well as some text to the bottom of my last layer (here: my layer is called “content 4). Then we use the following interaction pairing: “When the user clicks/taps” then “scroll the page” and select “to top” as position with a duration of 1 second and then add for every content and loading layer the additional reaction “change layer visibility” and set the visibility to “hide”. But don’t forget to display the first content layer (here: Content 1) as it represents the start of the feed. Voilà! To test your infinite scroll page open your browser to experience the behavior and start the simulation of your project by selecting it from the project list. That’s it! You just finished your first infinite scroll page. Recently, we spoke about mobile navigation patterns and their impact on creating valuable content on limited screen space without losing important options. This time, we take a closer look at the sidebar. The sidebar is best used to offer a secondary view that contains additional options like user settings, a list or a contact form etc., but it doesn’t make you leave the current screen. It’s a collapsible panel, often with the same height as the screen, that only slides in with a tap on an icon, usually a gear wheel or persona icon. To visualize our navigation pattern, we go back to our previously created project called “Watch it!“. You might remember: This mobile app contains a navigation bar with an overflow menu. 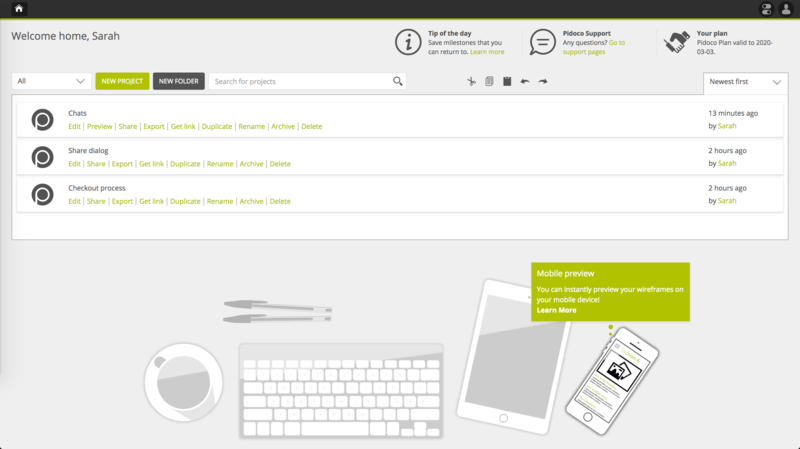 Today, we’ll add a sidebar to it which can be accessed via the persona icon in the top right corner. The sidebar grants access to the user profile and various profile settings and options. Recap: In our mobile app, we have already created one start page with one layer that contains an overview on the available movie genres. Also we built a navigation bar on another layer which contains a hamburger menu on the left and the overflow menu acts as a collapsible quick-access menu to the available movie genres. For the second part of our “Watch it!” project, we need in total: 1 page for the sidebar itself and one page for each entry within the sidebar. Let’s create the actual sidebar which will list all available options connected with the user profile of this app (changing password or language settings or getting in touch with the support etc.). To do so, we add a new page (here called: “1-Sidebar”) and immediately add the content. Here: I used a grey rectangle as background and added text stencils. As our sidebar will only give an overview of the available options, we create a new page for each entry of the sidebar. (In my project I built a total of 8 pages.) Now let’s fill the page with content. 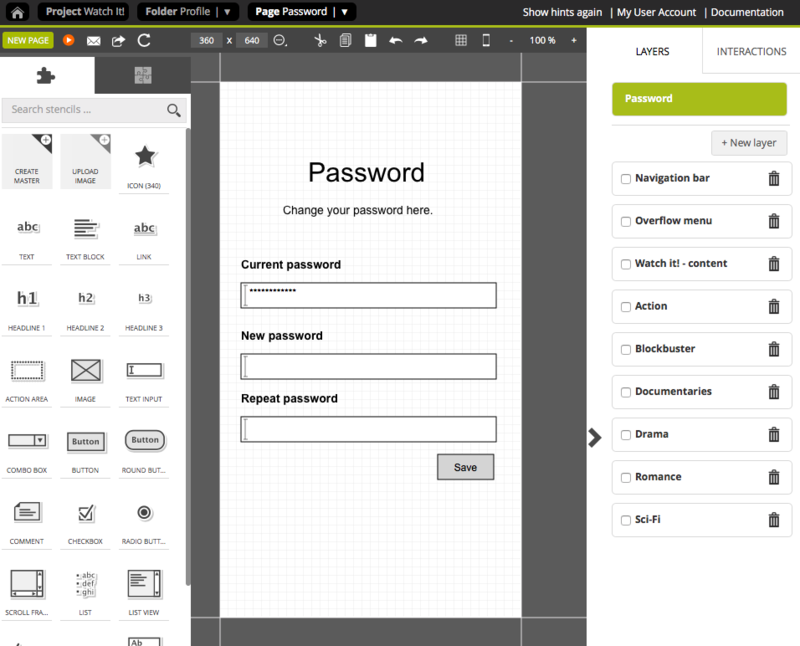 Here I added some text elements, text input fields and a button on the “Password” page. To save time, just create one page first, then duplicate it and then alter the content on the remaining 7 pages. Let’s go on with the interactions. We’ll have to take three steps now because 1) the sidebar is supposed to be slideable, 2) the sub-entries listed in the sidebar should be clickable, 3) the sub-level pages of the sidebar have to be slideable to re-access the sidebar panel again. To leave the sidebar and get back to the start page of the “Watch it!” app, the sidebar is supposed to disappear with a swipe gesture. 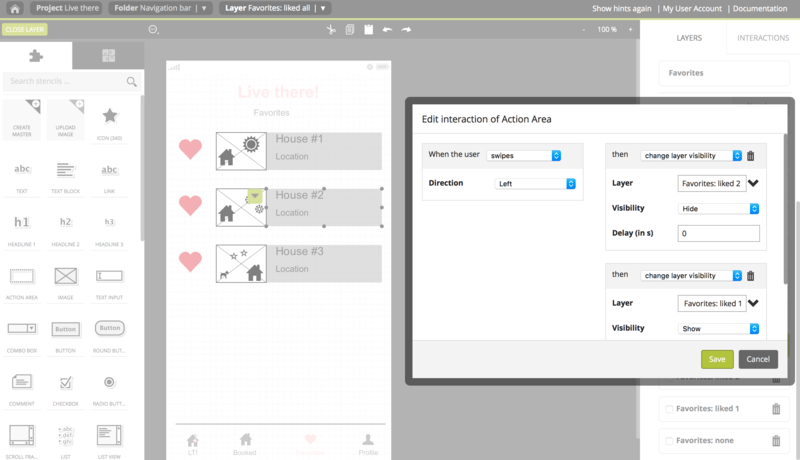 So we select the grey rectangle (as it spans the entire page), open the interaction dialog and add the action when the user “swipes”, set the direction to right and use the reaction “show page”. 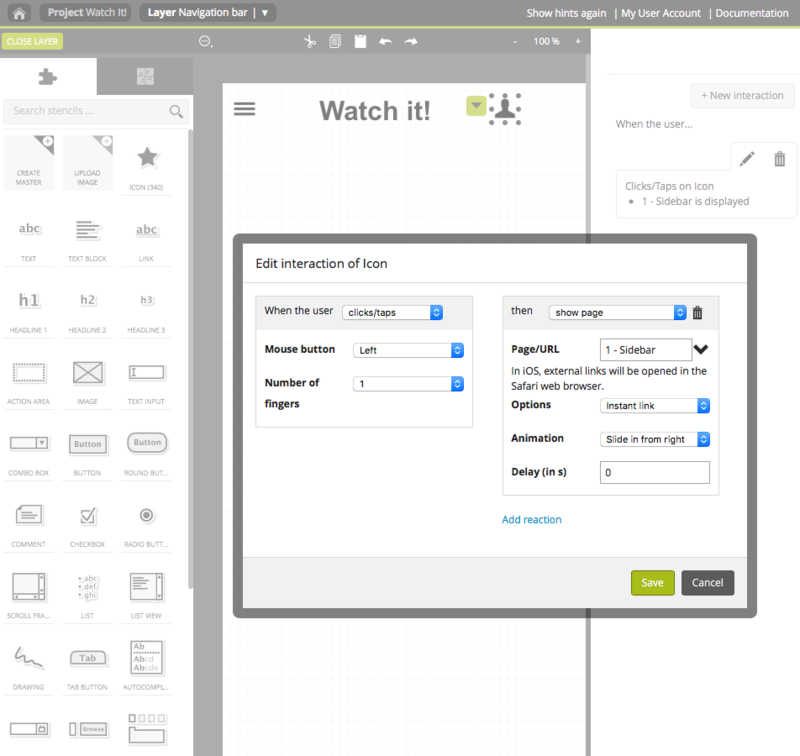 We refine the interaction selecting the option “Instant link” and setting the animation to “slide in from left”. Having already created the 8 pages that represent the content of each entry of the sidebar panel, we continue with creating interactive links. To do so, we open that page (Here: 1 – Sidebar) and click on the respective text, open the context menu and select the respective page from the dropdown menu next to “Target”. Here: I linked the entry “Change password” with the page called “Password”. Repeat that step for the entries of sidebar. Finally, we want to add more interactions to the pages that display the sidebar content. To leave the sub-level view and go back to the sidebar panel, we want to use a swipe gesture. So we open one of the previously created sidebar pages. Let’s start with the first one: I opened the page called “Password” and added two action areas for that parts of the screen that are empty. (Hint: They might even overlay other elements like the headline.) Again we need the interaction pairing: When the user “clicks/taps” then “show page”, select the previous sidebar page, set the options to “Instant link” and the animation to “Slide in from left”. Building a slideable page for each entry of the sidebar. To save time again, just copy and paste the action areas to the remaining 7 pages and adjust the linked pages. 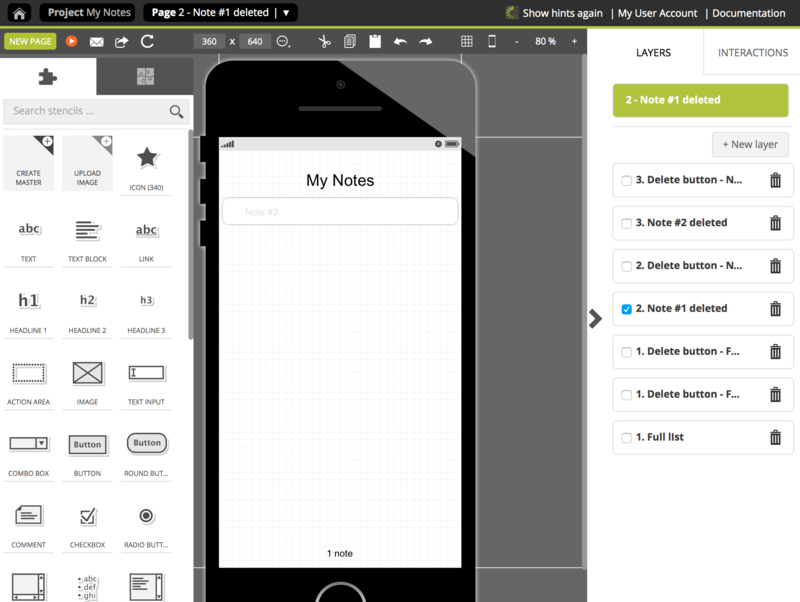 Now we open the layer that contains our navigation bar and add a persona icon to the navigation bar. To do so, we use the quick-search option atop of the stencil palette and drag the respective icon to its position. All that’s left is connecting the sidebar with the profile icon in the navigation bar. To do so, we select the persona icon on the right and add the interaction pairing when the user “clicks/taps” then “show page” , select the one that contains the sidebar and use the animation “slide in from right”. Voilà! To test your sidebar, take your mobile device, open the Pidoco app (available via Google Play or the App Store) and start the simulation of your project by selecting it from the project list. 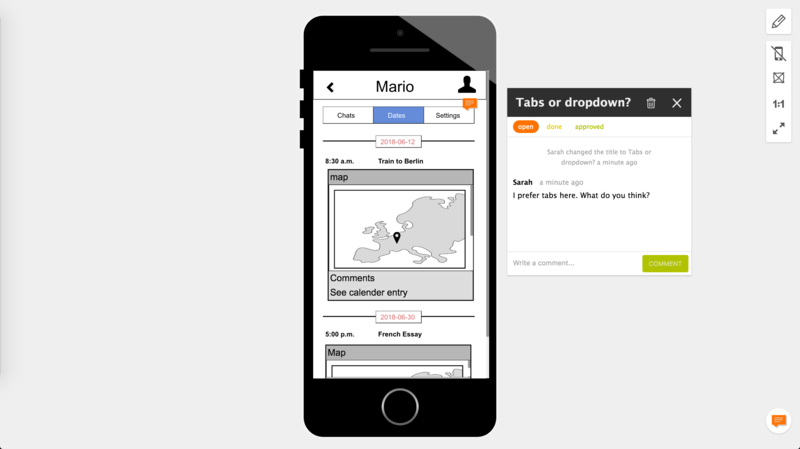 Navigation patterns are the key to make the most out of the precious screen space on a mobile device. Many different navigation paths can be used and not long ago we had a look at the 7 commonly used patterns and typical use cases. 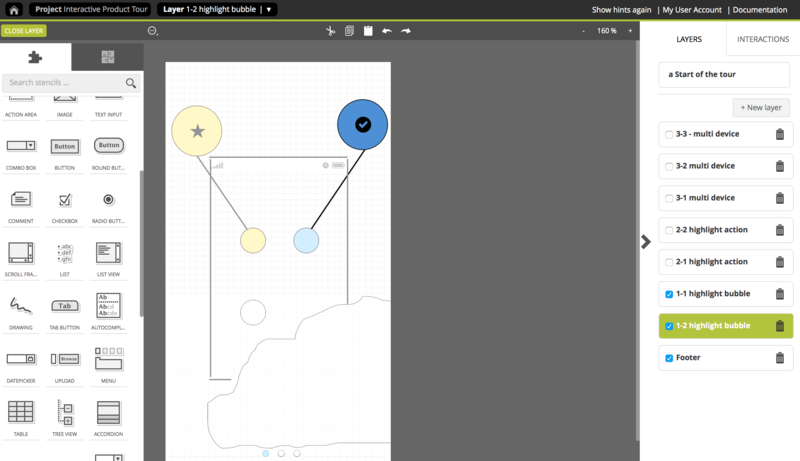 You can quickly create these navigation patterns with Pidoco. Today, we’ll take a look at the overflow menu. The overflow menu is best used to stow away a large number of additional options or menu entries that are not often used but still necessary. For the navigation in mobile apps with very little space that’s a good way to keep the screen clear. Usually, this navigation pattern is found in a navigation bar at the top of the screen and is connected to a hamburger menu. To open the menu, just tap on the icon. To visualize that navigation pattern, I created a mobile app that contains a navigation bar at the top of the screen which includes an overflow menu. The app offers different movie genres you can access via the start page with a tap on the colored rectangle. Additionally, you can select the movie genres on any screen via an overflow menu. If you’re curious, here’s a preview of my finished project called “Watch it!”. 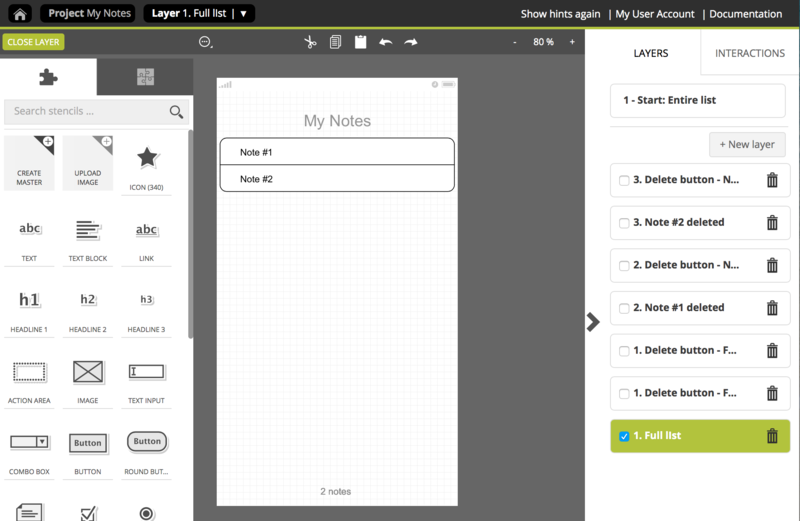 To build the app, we need multiple layers and pages. For my project I added 1 page that serves as the start page. With a click on “+ New layer”, I created a layer that contains the overview of the available movie genres. Here I added differently colored rectangles and icons representing one movie genre and activated the layer (Here called: “Watch it! – content”). You can link these elements later after you created the overflow menu. It’ll work the same way. 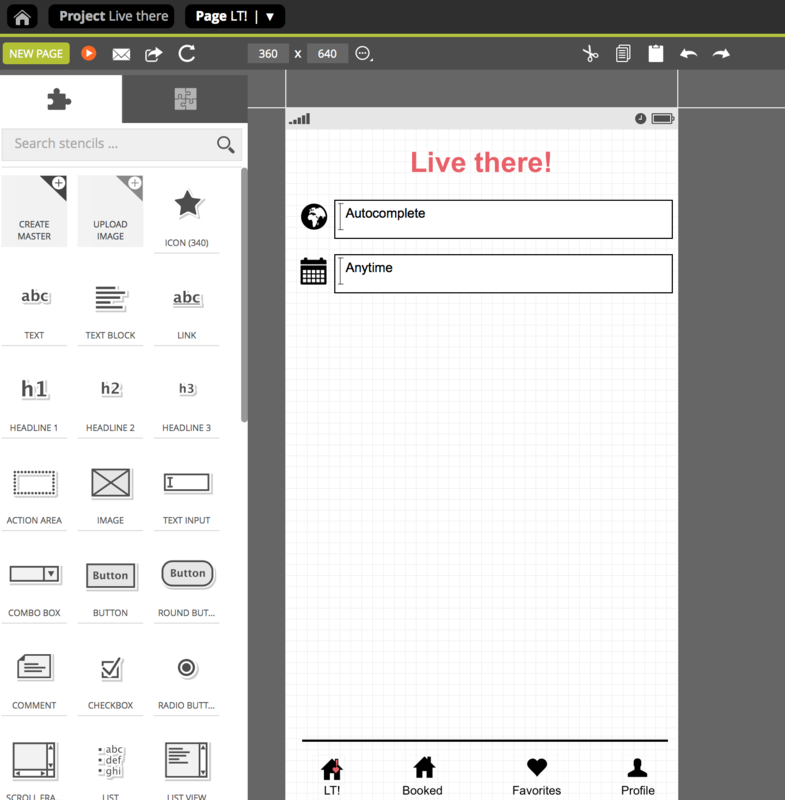 Having built the start page, we continue with our navigation bar. To do so, we create a new layer. The navigation bar will be located at the top of each page and contains the name of the app and the icon which is connected to the overflow menu. Here I used the icon with three lines and added it to the left. 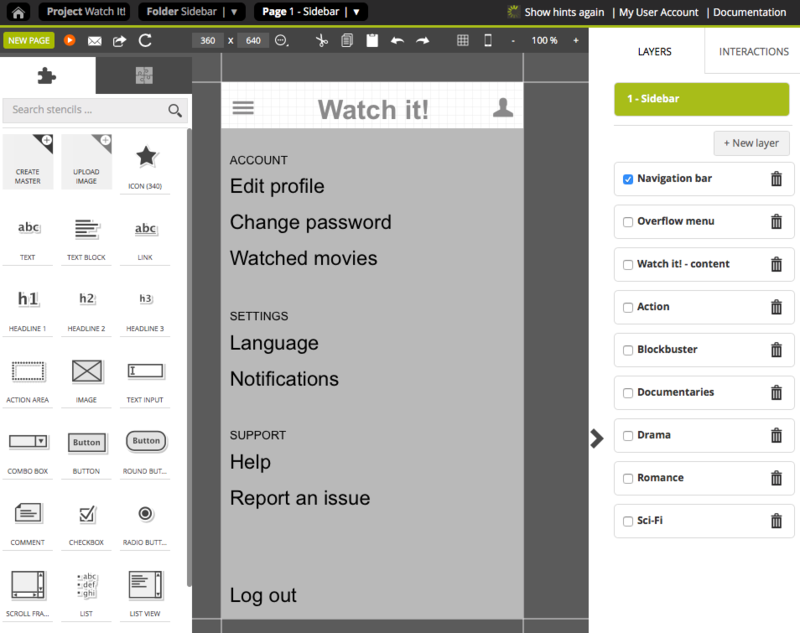 Building the elements of the navigation bar including the icons for the overflow menu. In total 6 different movie genres are available and a tap on the icon in the overflow menu directs to the respective content. That’s why we need one layer for each category. So we click on “+ New Layer” again, add stencils and activate the layer. Here I added some text and an image placeholder as well as a red triangle to make it look like a playable video. Hint: Save time by multiplying that layer and only change details like the headline etc. for each layer. Just go to the Project view and select “Clone element” from the context menu. To build our overflow menu, we create a new layer by hitting the “+ New layer” button in the layers panel and it opens where we add the content of the menu. Here: I added the same 6 icons representing each movie genre. Adding an icon for each movie genre to the overflow menu. Having built all the layers, we go on adding interactions and start with the first entry of the overflow menu. A tap on an icon displays the respective content of the selected movie genre. So we use the following interaction pairing: When the user clicks/taps then show page and we select our start page as it serves as our app basis. Then we add another reaction and use change layer visibility, select the layer to be displayed (Here I started with the first entry “Action”.) and set the visibility to “show”. Since we can jump between the entries of the overflow menu, all the other layers that contain a different movie genre as well as the layer showing the overview (here: “Watch it! – content”) and the overflow menu itself need to be invisible. That’s why we add more reactions and use “change layer visibility” for each one of them and set the visibility to “Hide”. Making the overflow menu interactive using multiple reactions. Hint: Open the interactions panel in the right sidebar, highlight all elements of your overflow menu, and then click on “Apply these interactions to the selection”. 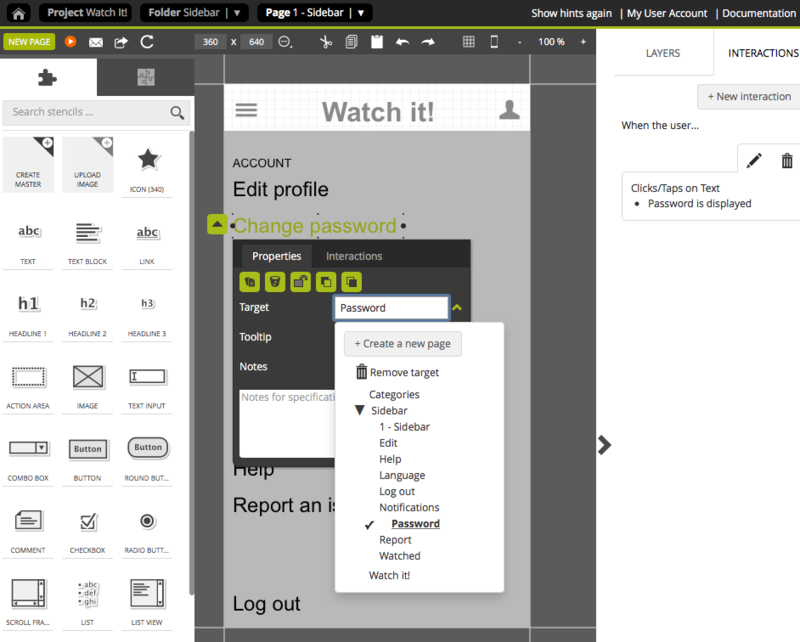 Then you only have to change the visibility of the layer that is associated with each menu entry. Copying the same interactions to multiple elements. There’s also the option to close the overflow menu without selecting a movie genre. 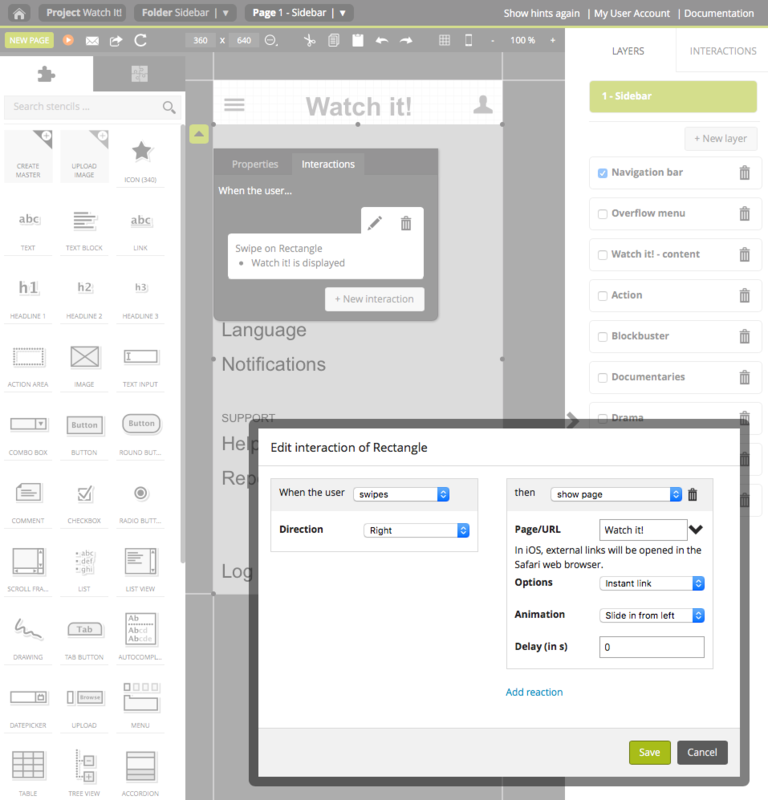 To realize that we add an action area to the right of the overflow menu and span it across the remaining screen width. Then, we add the user action “clicks/taps” and the system reaction “change layer visibility”, select the layer that contains the overflow menu and set the visibility to “Hide”. Making the overflow menu disappear without a selection. Finally, we connect the overflow menu with the hamburger icon of the navigation bar which is displayed at the top of each screen. A tap on the icon makes the menu appear or disappear. That’s why we open the interaction dialog for that icon, select a tap action, use “change layer visibility” and select the layer that contains the overflow menu. But this time we set the visibility to “Toggle” so it will be shown or hidden with only one tap. Access and leave the overflow menu with only one tap. Voilà! To test your overflow menu, just open the Pidoco app on your mobile device (available via Google Play or the App Store) and start the simulation of your project by selecting it from the project list. That’s it! You just finished the your mobile app that includes an overflow menu. Recently, we launched the first part of the series on working with multiple reactions and together created an online store with an automatic carousel and an adjustable shopping cart. This time, we’ll build a mobile app and make the most out of limited screenspace while still creating impressive prototypes. In Pidoco that magic happens with the use of extended interactions. Let’s have a look at today’s example: a mobile app that lets you click through images, like them and create a favorite list. To give you a little inspiration, here’s what my finished project looks like. 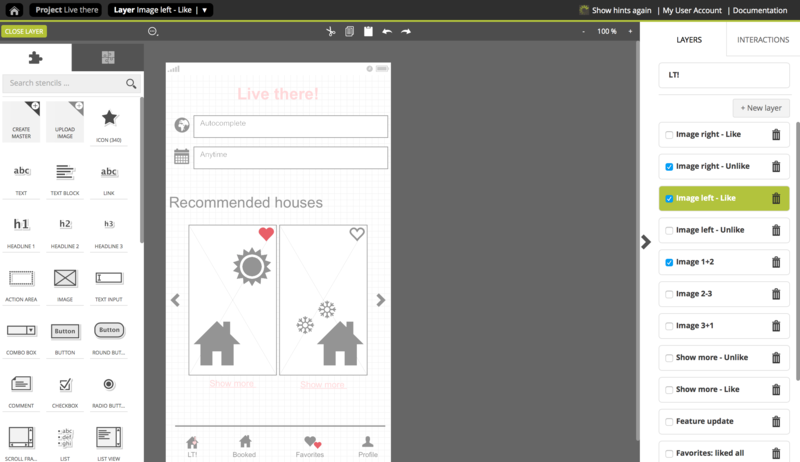 The app called “Live there!” includes a tab panel with several images of rentable houses on the start page. Those images can be liked, and additional information is displayed with a tap on “Show more”. Reservations can be requested and a click on the heart icon adds the selected house to the favorites list. All the liked images are listed on the page “Favorites” and of course can be edited and removed from there again. A small overlay on that page gives additional information simulating a feature update and disappears after a few seconds again. 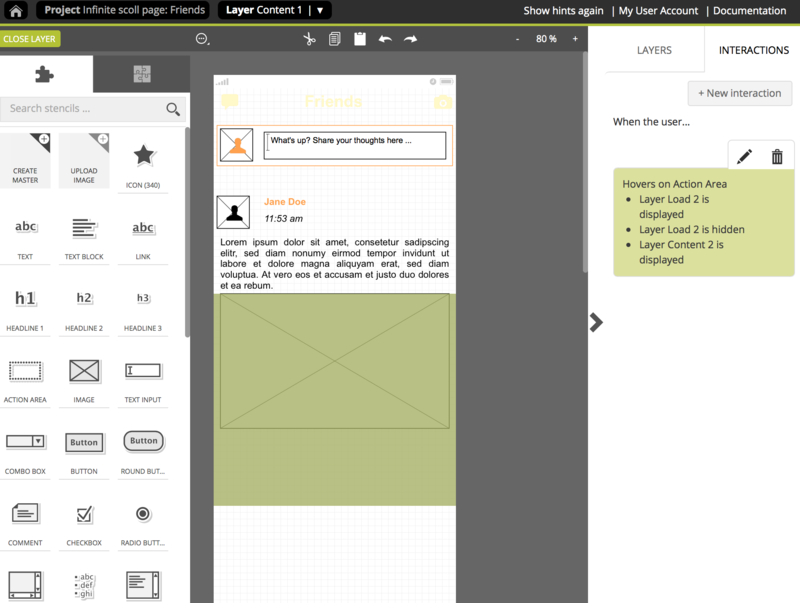 We start with the basic structure of the app by adding the content to the start page that is supposed to be sticky. Here I used a status bar at the top, added a navigation bar from the pre-designed templates and added some text and a few icons. Hint: We’ll need several pages for the app – one for each navigation bar entry, one for the calendar and one for each real estate image that will be displayed with a click on “Show more”. The quickest way is to duplicate the page in the Project View. Goal: Double tap on the image of the real estate to like it, and the white heart turns red. Ingredients: 5 layers are needed: one layer for the image panel itself and four layers to switch the like status for the images. Each image needs one layer for the status “liked” and one layer for the status “unliked”. Having built our app basis, we now create the image panel on the first layer with a click on “+ New layer” and then add two image stencils to it – one for the image on the left, one for the image on the right. We can combine the two images in one layer. As the panel with the first two images has to be displayed by default, we check that layer (here called “Image 1+2”) in the layers panel. Next, we need a second layer to add the “unliked” state of the left image. Here I used a heart icon without fill color and placed it at the upper right corner of the image. 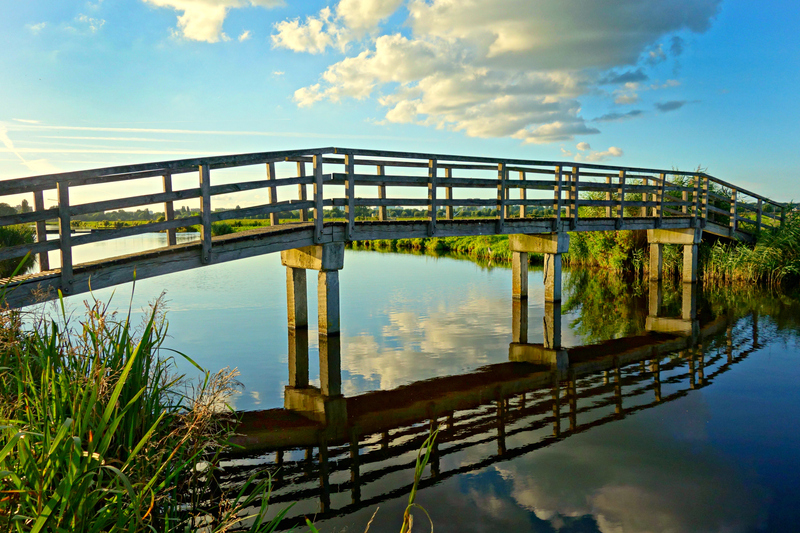 As this is the default setting of the image, we activate that layer in the layer panel. Finally, we add the third layer to show the “liked” state of the image. You can copy the content from the previously created layer and only change the heart icon to a filled heart by clicking on “Change” in the context menu and selecting the right icon. Here I changed the color from black to red. On layer four and five, we do the same as in layer two and three for the right image. All that’s left is adding interactions to the images to make the heart change from white to red after a double tap. Each image can have one of two states: liked or unliked. So we open the interaction dialog of the image (right click) and add the an interaction with the trigger “double clicks/taps” and the reaction “change layer visibility” for the layer “Image left – Like” with the visibility set to “Toggle”. This will make the heart with the red fill appear, but we also need to hide the empty heart, so we add a second “change layer visibility” reaction with visibility set to “Toggle”, but this time for the layer “Image left – Unlike”. Voilà – done. Repeat this step for all the other images that you want to add to the app. Goal: An overlay pops up after the page has been opened and disappears after 5 seconds. Ingredients: Here only 1 layer and one page are necessary. Once more, we need a new layer which contains the overlay that shows up for 5 seconds after the page “Favorites” has been loaded. Here: I added a grey rectangle and some red text. To make the overlay appear on page load, right click on the page to open the page context menu and in the “Interactions” tab add the following interaction: When the user “loads the page” then “change layer visibility”. 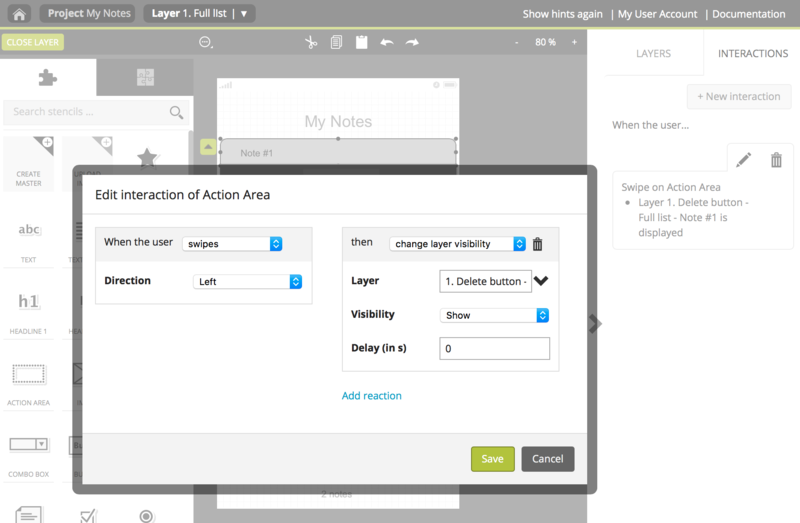 To make the layer disappear automatically, we add add a second “change layer visibility” reaction, set the visibility to “hide” and specify a delay of 5 seconds. Goal: With a swipe gesture, previously liked images can be removed from the favorites list. Ingredients: In total, 4 layers and one page are needed – one to display all liked images, one to show a text when there are no favorites yet, one layer for one and another layer representing two favorite images on the list. We start off creating the layer that contains the list with all possible entries of the “Favorites” list. Here I added a heart at the beginning of the row, an image and some explanatory text. The entries can be removed from the top to the bottom with only one swipe gesture. For that swipe gesture we add an action area covering the area in which the swiping is intended (e.g. the space at the right side between the image and the frame). Then we add a “swipes” interaction to the action area with the direction “left” and a “change layer visibility” reaction for the current layer with the visibility set to “hide”. But we need another reaction, because the next layer that contains 3 instead of 2 favorites needs to be displayed at the same time. 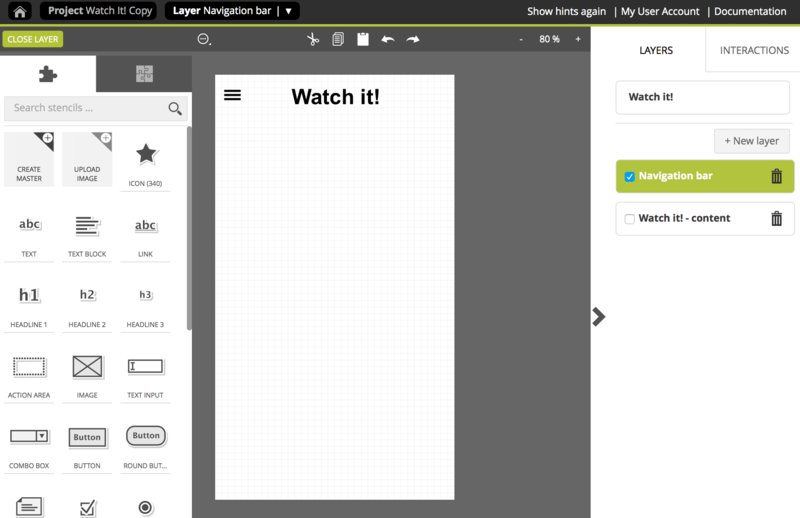 So we add another “change layer visibility” reaction, select the layer with 2 items and set the visibility to “show”. Repeat that step for each entry of your favorites list. That’s it! You just finished the last part of the mobile app. Sometimes, we need to simulate use cases where one single action by the user triggers multiple reactions. For instance, a click on the “Play” button of a song within a music application on your computer or mobile device not only plays the music but also gives a visual feedback by displaying e.g. the album cover. 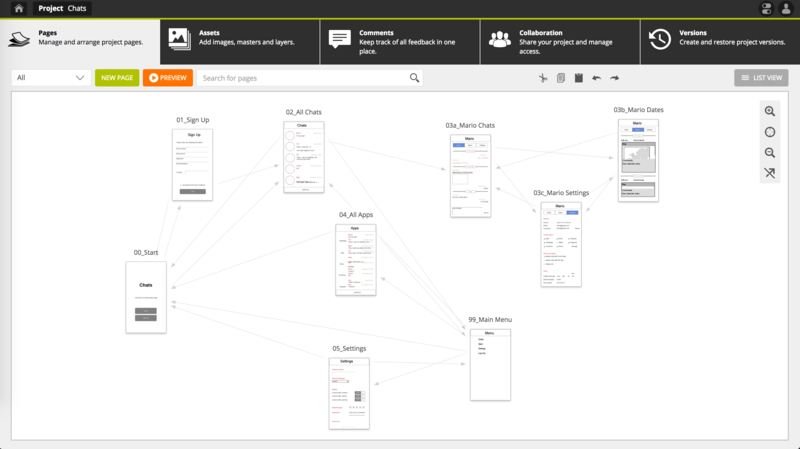 This can easily be modelled in Pidoco using the “Extended Interactions” feature. In Pidoco interactions consist of one user action (the trigger) and one or several system reactions. 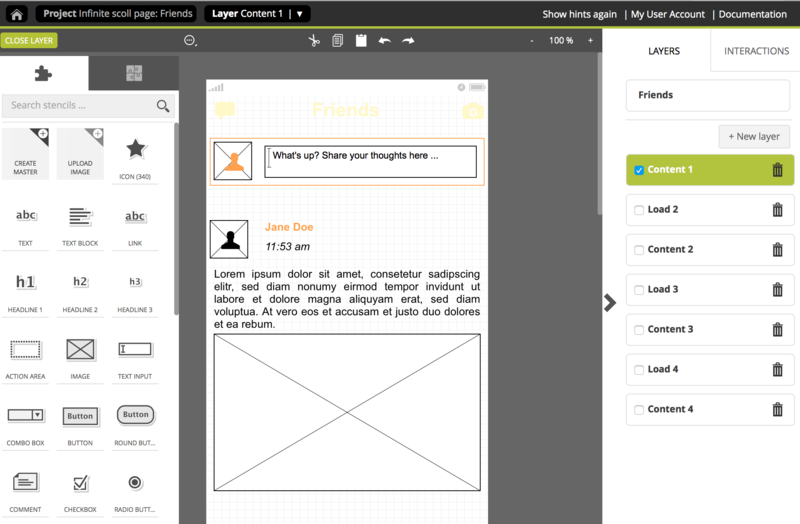 Interactions can be attached to pages, stencils and of course to layers and can vary depending on where you use them. 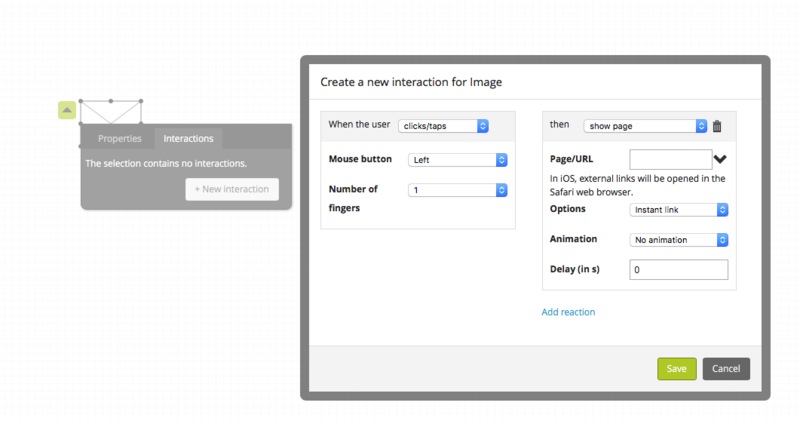 To add interactions, just open the context menu of an element, select the “Interactions” tab and click “New interaction”. Now you can start defining how the system should react to specific user inputs. 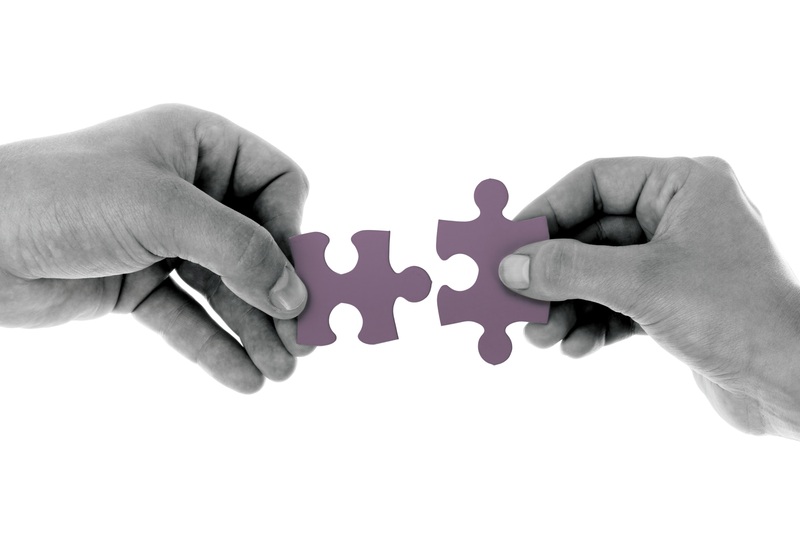 Hint: When working with interactions, it is helpful to structure the project first, i.e. create pages and layers upfront, and then come back to add interactions. This makes linking content much easier. So much for the theory. Now let’s have a look at an example: the online shop and to give you a little inspiration in advance, here’s what my finished project of the online store looks like. It also includes a complete checkout process for the purchase of article 1 as well as for the purchase of two articles and includes a “Success” page, too. All those pages, especially the redirections, contain multiple reactions and are based on the below mentioned interaction pairings. 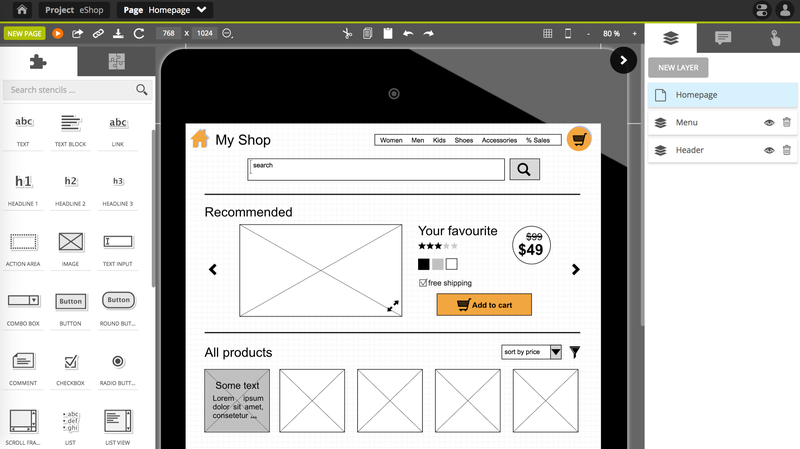 Screenflow of the final version of my online shop. Goal: The carousel automatically starts after accessing the page for the first time, then runs through several product slides. The slides change every 2 seconds. Ingredients: The carousel consists of three layers, each representing one product slide on the main page. Since the carousel behavior is tied to the page being loaded, we attach the interaction to that page with a right click on the page to open the context menu and add an interaction. 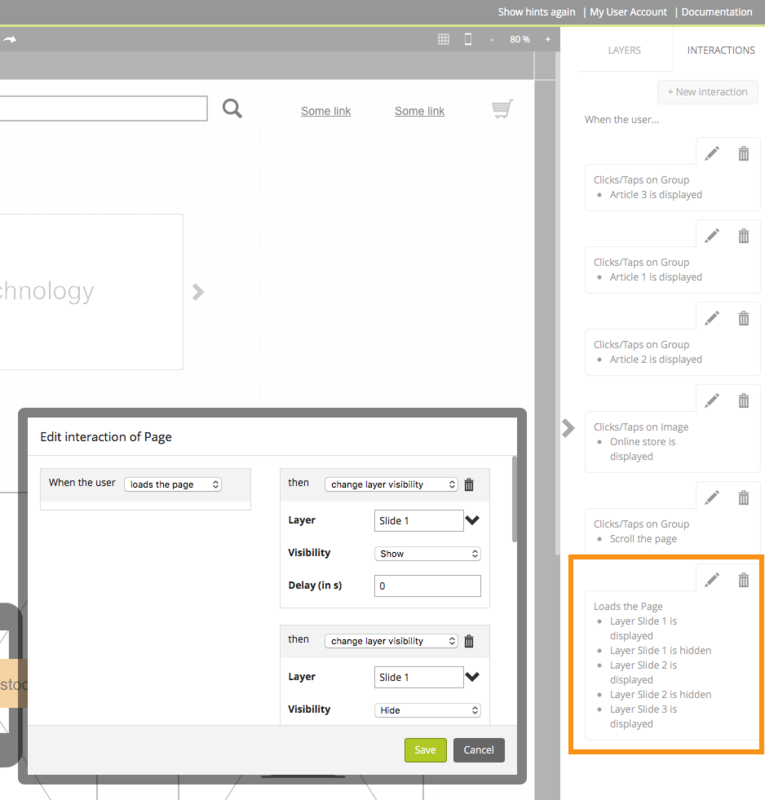 Select “When the user loads the page” as the trigger and “then change layer visibility” as the reaction, choose the layer with the first slide and set the visibility of slide 1 to “show”. To make the carousel cycle through several slides one after another, we need to add additional reactions and use delays (2 seconds) to space them out over time. So we click on “Add reaction” at the bottom of the Interaction dialog. We change the visibility of the layer again, but this time we select “Hide” and add a delay of 2 seconds. At the same, slide 2 needs to be displayed. So we add another reaction and set the visibility to “show” and add the delay of 2 seconds. Repeat for slide 3. Adding multiple system reactions to create an automatically starting carousel. That’s it! The first part of our web store is already built! Goal: Adjust the status of the shopping cart independently of the current page (e.g. to continue shopping after adding an article to the cart). – 3 layers for the cart icon on the top right of the page including the different cart states (empty cart or 1 article, 2 articles). 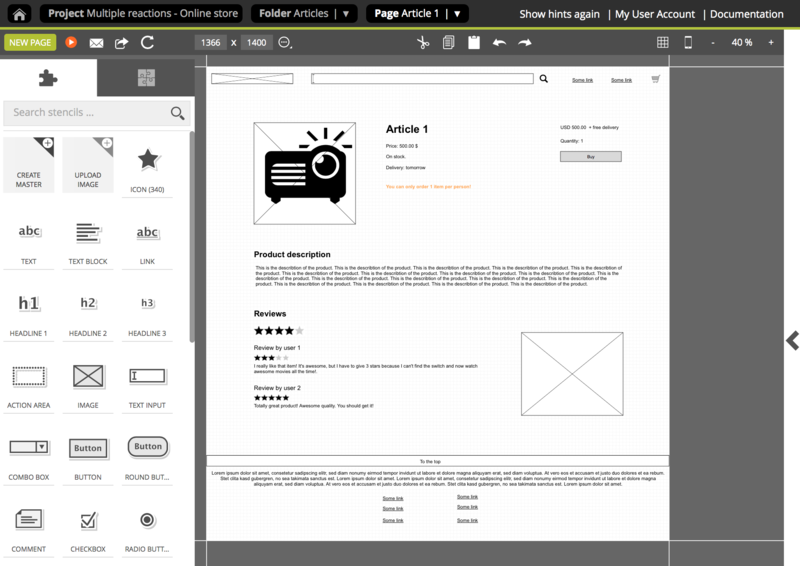 Adding content to the first product page. “then change layer visibility” with visibility set to “show” in order to make the layer with the new cart status “cart – 1 article” appear. Making the “Buy” button interactive and adjusting the quantity of the cart. Now let’s jump to the confirmation page, which should offer an option to return to the article overview to continue shopping. 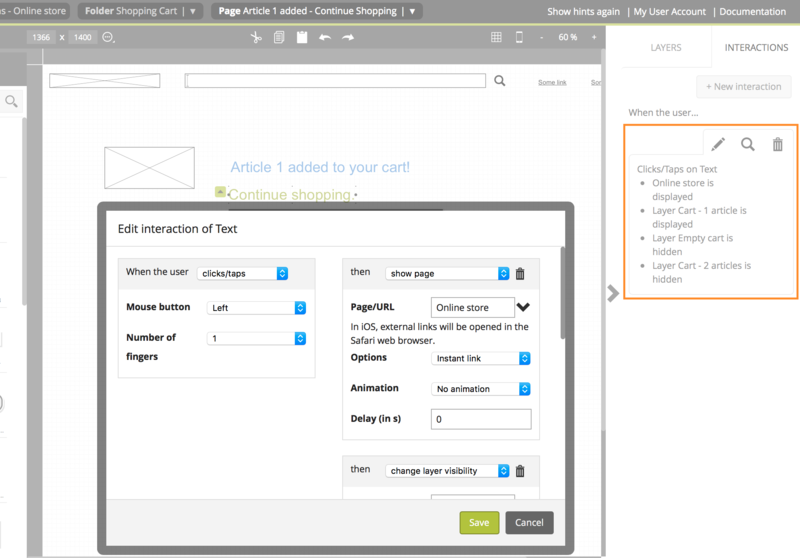 To model this behavior, we can use a similar reaction: a click/tap trigger should be combined with a show page reaction to display the start page as well as two change layer visibility reactions to display the correct cart status (1 or 2 articles) and hide any other cart status layers. That’s it! You just finished the last part of your online store.